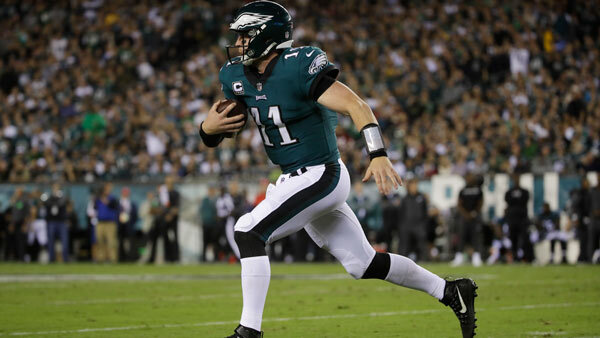 PHILADELPHIA (WPVI) -- Philadelphia Eagles quarterback Carson Wentz has been named the NFC Offensive Player of the Week. Carson Wentz - wins NFC Offensive POW! Wentz tossed four touchdown passes and ran for a career-best 63 yards in the Eagles victory over the Washington Redskins Monday night. The second-year quarterback has led the NFL-best Eagles (6-1) to five straight wins and is an early front-runner for MVP. Four more touchdowns and another big win. Watch the report from Sarah Bloomquist on Action News at 6 p.m. on Oct. 23, 2017.